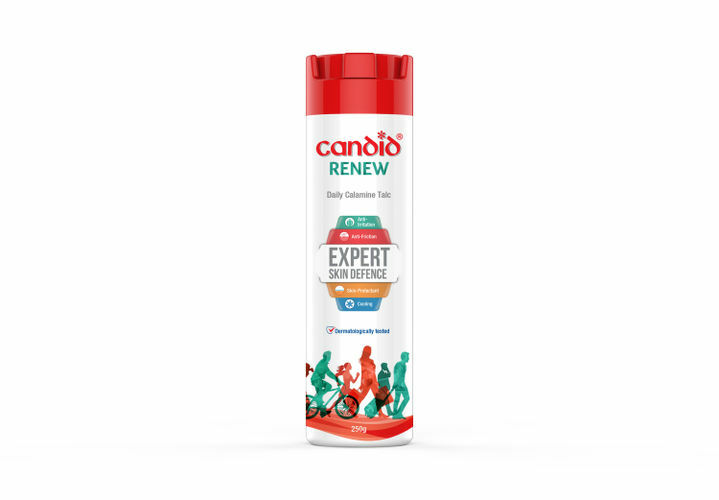 Candid Renew Daily Calamine Talc can be used to treat many kinds of fungal infections. It provides relief from skin irritation caused by friction and rashes. It helps in skin regeneration which restores health of your skin. Candid powder (1% Clotrimazole) is ideal for prevention or treatment of fungal infections such as ringworm, dhobie itch, athlete's foot and infections resulting from excessive sweating. It can be used as an anti-fungal agent in excess sweating, as a prickly heat and for nappy rashes as well. Additional Information: Glenmark is one of the leaders in dermatology in India, with a wide range of product offerings that serve diverse therapeutic areas in skin care. They are leaders in anti-fungal segment with our flagship brand being the Candid range of products. Explore the entire range of Talcum Powder available on Nykaa. Shop more Candid products here.You can browse through the complete world of Candid Talcum Powder .